San Jose, CA – July 20, 2017 – Angie Hospitality, creator of Angie, the world’s first 24-hour interactive guest room assistant, Wi-Fi and room control technology solution built for hotels and resorts, has been selected to participate in a panel discussion at the HTNG Asia-Pacific Conference, taking place July 25 to July 27 at the Shangri-La Hotel in Singapore. Angie Hospitality’s CEO, Ted Helvey, will serve as a key panelist on the “Hello Alexa…New Voices in the Guestroom Experience” session on Wednesday, July 26 from 11:20 a.m. to 12:15 p.m. in Tower B of the hotel. During this informative session, conference attendees will gain valuable insights and knowledge on emerging voice-activated technologies and how these solutions are being deployed in hotel guest rooms to enhance both guest satisfaction and property operations. Angie, the world’s first cloud-managed, enterprise-class, voice- and touch screen-based guest room assistant and integrated room control device, also serves as a secure, in-room Wi-Fi access point. Angie responds to a variety of guest requests using her advanced, multilingual voice and high-resolution touch screen interfaces. Guests have the option of making requests via simple voice commands, or through Angie’s interactive touch screen as an alternate method of requesting hotel services or amenities, such as instantly connecting multiple guest devices to Wi-Fi, setting alarms, playing music, making phone calls, and confirming or taking reservations. In addition to maximizing the hotel stay experience for guests, Angie also offers a plethora of operational efficiencies to hotel management and staff. With her ability to recognize unoccupied rooms through the use of occupancy-sensing technology, Angie can adjust temperature or lighting to help lower utility costs and help meet sustainability and efficiency goals. Her digital display screen can promote on-site amenities, such as restaurants, spas and retail outlets to further increase hotel revenue opportunities. Hotels can also offer event organizers a way to engage and communicate with conference and meeting attendees, using a new interactive in-room medium. Helvey’s selection for participation on the Asia Pacific Conference panel comes on the heels of Angie Hospitality’s HTNG TechOvation Award, which was announced at HT-NEXT in April 2017. This prestigious industry competition recognizes new and innovative technologies in the hospitality sector. The voice-command panel session at the Asia-Pacific Conference will include Helvey, along with three other panelists, as they give industry insight on where voice command technologies are headed in the hotel industry and how they are expected to transform the hotel guest experience. Angie is currently being implemented at multiple hotel properties in the U.S. and will be available for general distribution in Q3 2017. For more information on Angie’s full suite of capabilities, please visit www.angie.ai. 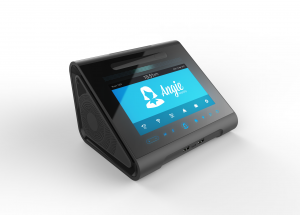 About Angie Hospitality | Angie Hospitality, led by industry veterans, designs and develops the only 24-hour interactive guest room assistant, Wi-Fi and room control technology solution built just for hotels and resorts. The 2017 HTNG TechOvation Winner, Angie is the world’s first enterprise-class, cloud-managed platform built on a secure, scalable, and highly-available architecture that is continuously monitored and enables her to self-configure for each property and room as soon as she’s plugged in. With headquarters in Silicon Valley and London, Angie Hospitality currently offers services in North America and Europe, expanding soon to Asia Pacific and the Middle East. For more information on Angie Hospitality, please visit www.angie.ai and connect with us on our social media channels – Facebook, Instagram, Twitter and YouTube.